Star has been on the move over much of the winter with periods of some weeks when he settles down near one of the Midland’s loughs, a far cry from his former breeding site in south-west Connemara. As the map shows Star hasn’t been back ‘home’ to Connemara since September 2015. In late autumn, up to early-mid Oct 2015 Star was in the north-west flitting between Roscommon, east Mayo and north-east Galway (red track on map). On 12-13 Oct he made a brief trip north to Ballysadare Bay, Co. Sligo, an old stomping ground of his that he last visited back in the winter of 2009-2010! On 22 Oct he headed SE to Lough Ree then east to Lough Ennell/Owel on 25 Oct where he remained until 22-23 Nov, when he headed SE into Laois and Kildare before reaching one of his favourite haunts over the years, along the Arklow river near Woodenbridge, Co. Wicklow (green track). On 27 Nov he headed east over the Wicklow Mts to Pollaphuca/Blessington Lakes and back to the Midland’s lakes the next day. Star remained in the Ennell-Owel area of Westmeath throughout Dec. Then on 28 Dec he began a mini trip of Midland bogs (sky blue track) with a visit to Clara, Co. Offaly, Rosenallis, Laois next day, Athy and Dunnstown, Co. Kildare on 30th and 31 Dec then back to the Midland lakes on the first day of 2016. On 5 Jan Star headed south into the Slieve Blooms hills, east into Laois and back to Co. Wicklow on 7 Jan to roost near the village of Redcross (dark blue track). On 10 Jan he headed NW over the mountains again to near Manor Kilbride then on to roost in a small bog just north of Prosperous, Kildare next day before returning to the Midland lakes. 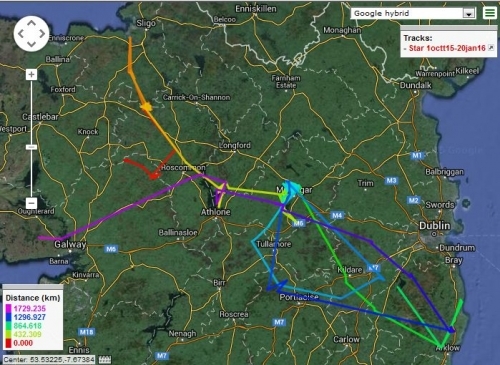 On 16 Jan Star headed east to Lough Ree, then west on 21 Jan to the Corrib for the first time this winter, roosting near Moycullen (purple track). So is Star going to revisit his old territory in Connemara? Will he find a female to replace his lost mate? Watch this space....! !